A total of 564 submissions were given the International Publication Award (IPA) in 2017. Nearly half of these came from UP Diliman, the biggest constituent university (CU) in terms of student population, faculty and degree-granting programs. It received the IPA for 239 journal articles and 22 books and book chapters. The College of Science and College of Engineering were the major producers of journal articles with the IPA. Their combined output translated to more than half of all journal articles with the IPA across campuses. The number of books and book chapters with the IPA from UP Diliman made up two-thirds of the system total. UP Manila had 153 publications accepted for the IPA last year while UP Los Baños had 140. 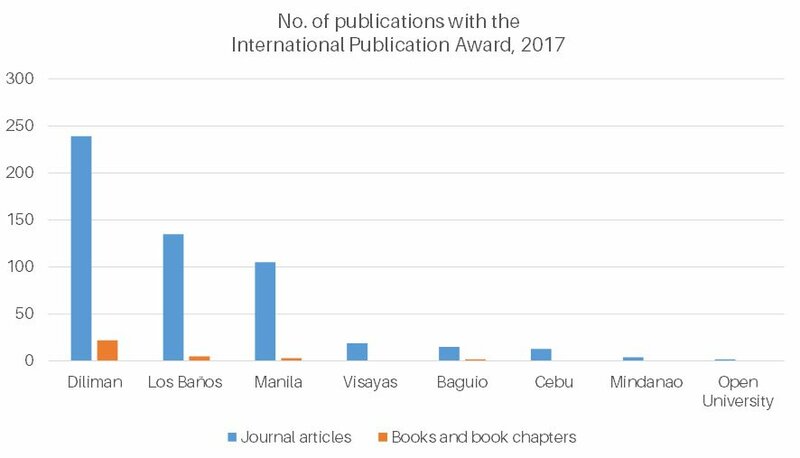 The five smaller CUs had 55 publications recognized with the award: UP Visayas, 19; UP Baguio, 17; UP Cebu, 13; UP Mindanao, 4; and UP Open University, 2. The majority of the articles from the CUs were published in journals with no impact factor or with impact factors less than 2. UP Manila had the largest number of papers in journals with impact factors approximately equal to or greater than 8. The impact factor, which looks at how often a journal’s articles are cited in other publications, is frequently used to measure a journal’s importance. 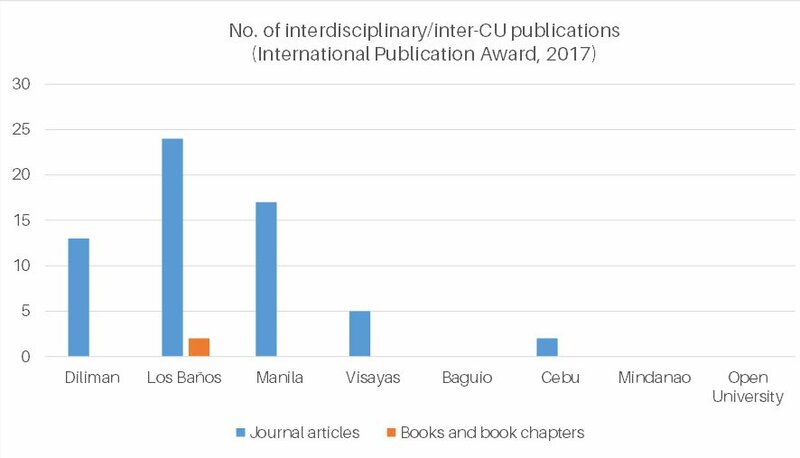 UP Los Baños had the most publications from collaborative work between or among colleges or CUs but UP Diliman had the most diverse inter-CU collaboration that involved UP Manila, UP Los Baños, UP Baguio and UP Open University. The count includes IPA applications for articles, books and book chapters published before 2017 but were filed only last year. Created in 1999, the International Publication Award recognizes faculty, REPS and students who have contributed to the body of knowledge through journal articles, books or book chapters of high quality. Articles must have appeared in journals indexed by Web of Science or listed by Scopus, while books and book chapters must have been published by recognized international academic book publishers, prestigious university presses or other highly regarded international publishers.